Greek: Humeis este (2PPAI) to halas tes ges; ean de to halas moranthe, (3SAPS) en tini alisethesetai? (3SFPI) eis ouden ischuei (3SPAI) eti ei me blethen (APPNSN) exo katapateisthai (PPN) hupo twn anthropon. Wuest: As for you, you are the salt of the earth. But if the salt loses its pungency, by what means can its saltness be restored? For not even one thing is it of use any longer, except, having been thrown out, to be trampled under foot by men. Young's Literal: 'Ye are the salt of the land, but if the salt may lose savour, in what shall it be salted? for nothing is it good henceforth, except to be cast without, and to be trodden down by men. LITTLE does the world think how much they are indebted to those very saints whom they “revile and persecute for righteousness’ sake.” (Mt 5:11) The extirpation of them (which is so much desired by many) would leave the world an entire mass of corruption, without any thing to heal its disorders, or to stop its progress towards utter destruction. Were they removed out of it, the rest would soon become as Sodom and Gomorrah (Is 1:9). The representation given of them in the text fully justifies this idea. They are called “the salt of the earth.” This, of course, must be understood of those only who have the spirit of religion in them: for all others, whatever they may possess, are as vile and worthless as the real Christians are good and excellent. You [emphatic: you alone] are the salt of the earth. "You", not governmental institutions, not educational institutions, not organizations, but "you" and "you alone" are the salt of the earth. Note that in this section Jesus shifts from "those" ("blessed are those… ") to the second person "you". He shifts from character to influence of this character. The point is that those who live out the Beatitudes (Mt 5:3-12) in the power of the Spirit, not might be, but actually are "the salt of the earth". How do we know that is what He means? "Are" is in the indicative mood which is the mood of reality. In other words, they really are the specific salt factor in this world. Furthermore, the present tense expresses a constant condition and indicates that saltiness is to continually be the lifestyle of every citizen of the Kingdom of Heaven every day of their life on earth. Think of the implications - you have a great purpose in God's plan and you have it all the time in every place you go! It does not matter whether you are rich or poor, highly educated or not, tall or short, etc, etc. You are an invaluable pawn in God's great chess match! What an incredible privilege citizens of the Kingdom of Heaven have been granted by their King, Jesus Christ! This is privilege we should not only cherish but one that should also create in us a sense of divine accountability. We are stewards of salt so to speak and one day we will give an account for how salty we were (cf 2Cor 5:10). The King does not give us an option at this point but calls us to a central responsibility to be salt to the world about us. How are you doing? Are you really living like a Christian? Are you using your money like a Christian? Are you talking like a Christian? Are you conducting your family like a Christian? Are you using your leisure time like a Christian? Does the language change when you are around? Does the attitude of the workplace improve because you work without complaining, you show up on time, you treat everyone with kindness, you refuse to enter into gossip? There it is, Jesus' disciples are sent into the world to be "the salt" in the world (note how often "world" is repeated in this passage). "You are either being corrupted by the world or you are salting it." Jesus' declaration of the state of believers leaves no room for a middle ground. Salt (217) (halas) is natural salt which purifies, cleanses, preserves from corruption. Its literal sense of “seasoning salt” is found in Matthew 5:13; Mark 9:50; Luke 14:34). Figuratively (see metaphor and terms of comparison simile metaphor)) salt appears in conjunction with believers’ characters and concerning their speech (Mark 9:50; Colossians 4:6). For an interesting discussion of salt see Pliny the Elder's (who is he?) article in Natural History, Book 31, chapter 41. Luke 14:34 "Therefore, salt is good; but if even salt has become tasteless, with what will it be seasoned? Salt was one of the earliest of all preservatives and was a valued commodity in the ancient world. Without any source of refrigeration, salt became the means of preserving meat from decaying, as the ancients rubbed down meat and fish to preserve it for regular use. Seafarers just a century ago would salt down their fish and meat to preserve them for the long transatlantic journeys. Salt was so important as a corruption preventative in the ancient world that wars were fought over it, and entire economies were based on it. In short, salt could literally make the difference between life and death in a time when fresh food was unavailable. The Greek writer Plutarch said that meat is a dead body and part of a dead body, and will, if left to itself, go bad, but salt preserves it and keeps it fresh, and is therefore like a new soul inserted into a dead body. Dead meat left to itself went bad, but, pickled in salt, it retained its freshness. The salt seemed to put a kind of life into it. The point is that salt preserves corruption. The Greeks called salt "charitas" (grace) because it gave flavor to things. Our speech must not be corrupt (Ep 4;29-note) and salt (God's grace) holds back corruption. A thoughtless word of criticism, a questionable remark, an angry word—any of these could tear down in a minute whatever Christian testimony others have tried to build up. No believer ought ever to say, “Now take this with a grain of salt!” Instead we need to put the salt into our speech! When we wish to stress a person's solid worth and usefulness we often say "That person is the salt of the earth." Salt was a valuable commodity in the dry Middle East and was used to barter. Our English word “salary” comes from the Latin salarius (“salt”). A person lacking integrity might have mixed white sand with the salt and then had more for trade. But salt mixed with sand lost some of its salty quality and became useless. Christians are to be the "salt of the earth". Salt acts secretly. We know that it combats decay, though we cannot see it perform its task. Its influence is very real nonetheless. Spurgeon - Our Savior was speaking of the influence of his disciples upon the fellows, and he first of all mentioned that secret but powerful influence which he describes under the figure of salt: “Ye are the salt of the earth.” No sooner is a man born unto God than he begins to fellow-men with an influence which is rather felt than seen. The very existence of a believer operates upon unbelievers. He is like a handful of salt cast upon flesh; he has a savor in himself, and this penetrate those who are in contact with him. The unobserved almost unconscious influence of a holy life is most effectual to serving of society and the prevention of moral putrefaction. May there be salt in every one of us, for “salt is good.” Have salt in yourselves, and then you will become a blessing to all around you. The domestic and medicinal value of salt both as condiment and preservative was as universal in the ancient world as it is today. Pliny declared that "salt has something of the nature of fire", and he quotes a current saying, "To the whole body nothing is better than sun and salt"
Lasting alliances or covenants were made by eating bread and salt, or salt alone (Aristotle). (Ed: See Trumbull's book = Covenant of Salt) See also What is a salt covenant? Cato, Virgil, and Pliny all refer to the ability of salt to improve the productivity of the soil. Salt has been valued from time immemorial. Roman soldiers were paid in salt and, if one were derelict in his duties, he was said to be "not worth his salt." Salt was used throughout ancient societies as a sign of friendship, (Ed note: see The Oneness of Covenant: Friend) a concept that continues to the present day. In the Arab world, if one man partakes of the salt of another man, that is, eats a meal with him, he is under his protection and care. If a man's worst enemy came into his tent and ate of his salt, he would be obliged to protect and to provide for him as though he were his dearest friend. Out of that idea grew the concept of a salt covenant, referred to in 2 Chronicles 13:5 (cf Nu 18:19), where God speaks of a covenant of salt made with David. Before the days of a notary public who could authenticate the legality of a document, when two men entered into a business agreement, they would haggle over terms until they had settled on the agreement. Then they would eat salt or portions of food together; eating salt bound them together in what they called a salt covenant. This covenant established a contract that was not to be broken. God prescribed salt as a necessary part of the sacrifices. "Every oblation of thy meat-offering shalt thou season with salt; neither shalt thou suffer the salt of the covenant of thy God to be lacking from thy meat-offering: with all thine offerings thou shalt offer salt" (Lev 2:13, cf Ezekiel 43:23, 24, Ezra 9:9, 10). God said that if they left salt out of their offering to God, it was an unacceptable offering. The offering demanded the whole, and the offering was incomplete without salt. "Can that which is unsavory be eaten without salt? or is there any taste in the white of an egg?" (Job 6:6). Someone has said that there are some 14,000 industrial uses for salt! And frankly, this is where we must sound a note of caution… interpretation of metaphors can be "tricky" especially if the expositor has a vivid imagination. Unfortunately, such interpretations may not be what God really intended by using a given metaphor like "salt". For example, some say salt was white and then reason that this whiteness pictures purity (and even compare it with purity of heart in Mt 5:8). Now while there may be some element of truth in such an interpretation, that is probably not the primary message Jesus intended to convey to His audience. Let's think for a moment about the context. Jesus is speaking in a time when there were no ice makers or refrigerators. There was need for a simple method of preservation of foodstuffs from decay and corruption and this was the primary function of salt. In fact the only way to preserve meat in the hot climate of Palestine was to salt it or soak it in a salt solution. This practice is still common in many remote areas of the world. It follows that the primary interpretation of the meaning of the metaphor of salt is that it speaks of a preservative agent which impedes corruption, decomposition and decay. The world, in contrast to what many "enlightened" members teach, is not evolving but devolving. The world is not going toward order but disorder. It is slowly decomposing and rotting away. If it is possible for your closest contacts to be neutral about Christ then there is something wrong with your Christianity. it calls for radical and costly application. Christians whose lives exhibit the qualities of the 'blessed' will have a preserving impact upon a society that, if left to itself, will rot and deteriorate. Without the influence of the gospel, society will suffer moral decay and become putrid, unfit for the consumption of good men and women… It is all too easy for us to despair as Christians because of our frailty and insignificance, personally or numerically. However, we must never give in to Satan's lie that we can be effective only when we have large numbers and a show of strength. Jesus' illustration of salt is an encouraging reminder that the apparently cheap and insignificant can influence its environment out of all proportion to our expectation. Sometimes this happens on a national scale. It is said, with some justification, that the only thing that saved England from a revolution as horrible and bloody as the French Revolution was the evangelical revival under the preaching and teaching of men like John Wesley and George Whitefield during the eighteenth century. Christians make plenty of negative comments and vent tons of frustration over the putrefaction of our society. But our culture is simply doing what comes natural, rotting because it has no preservative. As hard as it is to admit, we should quit leveling the blame of decadence on pagans and start asking why the Church is not more effectively preventing decay (especially of our ethical and moral values) from accelerating and exerting an ever increasing negative influence in our society. A Christian should be in the world and yet not of the world. How can this be? Consider the fish who, though he lives in the salty sea, does not taste salty. The impact of salty Christians has effected entire countries. Consider impact of the First Great Awakening (revival) on England at a time when the rest of Europe was embroiled in political upheavals. Even secular writers acknowledge that it was because of the impact of salty Christians like John Wesley and George Whitefield that England was spared the effects of the horribly bloody revolution that swept through France (see French Revolution) in the late 1700's. Salty believers really do prevent from corruption and decay! Andrew Murray lived an exceptionally holy life. Among those on whom his influence was the greatest were his children and grandchildren. Five of his six sons became ministers of the gospel and four of his daughters became minister’s wives. Ten grandsons became ministers and thirteen grandchildren became missionaries. Woodrow Wilson told the story of being in a barbershop one time. "This sanctuary can be a salt shaker. You can come in here once a week, have a lot of fellowship with all the other salt and think your job is accomplished. Instead, God wants to pick up this sanctuary and shake you out all over this city. He has brought you together as His salt only to scatter you. He wants you to be an influence for Jesus." We are not responsible for conversion, but we are responsible for contact. Jesus calls His loyal subjects to be pungent people who penetrate every level of society. Are you sitting or shaking? Be careful not to lose your saltiness. It's amazing what a pinch of salt can do to bring out the flavor of food. A big bowl of popcorn is absolutely bland without salt. Christianity is to life what salt is to unsalted popcorn!. Christianity gives flavor and seasoning to life. But too much salt can be distasteful. Even a little salt will make itself known as history as proven. One of those shining examples was a man named William Wilberforce, a small, even somewhat distorted man who took up a career in politics eventually gaining election to the House of Commons in England. He subsequently became a citizen of the Kingdom of Heaven in 1784, at age 25 proved his saltiness by taking an active stand against the slave trade despite repeated defeats in parliament. William Wilberforce died on 29th July, 1833. One month later, Parliament passed the Slavery Abolition Act that gave all slaves in the British Empire their freedom. He was a little salt that made his present felt. It has been documented that 0.04 ounces of table salt dissolved in 530 quarts of water can be tasted! "I might have entered the ministry if certain clergymen I knew had not acted and looked so much like undertakers." Paul's point is that we are to live the Christ life (for example characterized by the be attitudes). Not everyone will respond favorably to our life as we have seen in (Mt 5:10-12). As we have often heard, you can lead a horse to water and yet not make him drink. However add a little salt to his hay and you will "encourage" him to drink. Is your witness making unbelievers thirsty? At a missionary meeting some young people were discussing the text, "Ye are the salt of the earth." One suggestion after another was made as to the meaning of salt in this verse. "Salt imparts a desirable flavor," said one. "Salt preserves from decay," another suggested. Then at last a Chinese Christian girl spoke out and shared an experience none of the others had shared. She said, "Salt creates thirst." There was a sudden hush in the room. Everyone was thinking, "Have I ever made anyone thirsty for the Lord Jesus Christ?" Here are a couple of resources (each a 20-30 page booklet) you might want to read to give you some thoughts on how to be salty salt.. Some modern teachers seem to think our Lord said "Ye are the sugar of the earth," meaning that gentleness and winsomeness without curative-ness is the ideal of the Christian. Our Lord's illustration of a Christian is salt, and salt is the most concentrated thing known. Salt preserves wholesomeness and prevents decay. It is a disadvantage to be salt. Think of the action of salt on a wound, and you will realise this. If you get salt into a wound, it hurts, and when God's children are amongst those who are "raw" towards God, their presence hurts. The man who is wrong with God is like an open wound, and when "salt" gets in it causes annoyance and distress and he is spiteful and bitter. The disciples of Jesus in the present dispensation preserve society from corruption; the "salt" causes excessive irritation which spells persecution for the saint. Phil Newton issues a poignant challenge by way of a modern day prophet Dr Gresham Machen writing tha "Gresham Machen, in the last century, exhorts us, “Let us stop soothing ourselves with columns of statistics and face the spiritual facts; let us recall this paper currency and get back to a standard of gold” [God Transcendent a collection of 20 of his sermons with the final four sermons preached in the last four Sunday's of Dr Machen's life! "The Bible and the Cross" was preached 5 days before he died Jan 1, 1937!]. Though written half a century ago, Machen spoke like a prophet to our present day that values the showy, glitzy statistics of how many nickels and noses we have in our churches, but gives precious little attention to holiness in character and walk. Have we forgotten that it was a Rome that claimed grand statistics as a “Christian empire” that fell to the barbarians? While the show and numbers meant so much to the church in that day, the saltiness in society was lost so that the barbarians easily conquered them. Professing Christians failed to live like Christians, and their whole society crumbled. “You are the salt of the earth” is a truth to cherish, a reality to live in day after day, and a necessity for a civil, peaceable society. William Barclay on Salt - When Jesus said this, he provided men with an expression which has become the greatest compliment that can be paid to any man. When we wish to stress someone's solid worth and usefulness, we say of him, "People like that are the salt of the earth." In the ancient world salt was highly valued. The Greeks called salt divine (theion, Greek #2303). In a phrase, which in Latin is a kind of jingle, the Romans said, "There is nothing more useful than sun and salt." (Nil utilius sole et sale.) In the time of Jesus salt was connected in people's minds with three special qualities. (i) Salt was connected with purity. No doubt its glistening whiteness made the connection easy. The Romans said that salt was the purest of all things, because it came from the purest of all things, the sun and the sea. Salt was indeed the most primitive of all offerings to the gods, and to the end of the day the Jewish sacrifices were offered with salt. So then, if the Christian is to be the salt of the earth he must be an example of purity. One of the characteristics of the world in which we live is the lowering of standards. Standards of honesty, standards of diligence in work, standards of conscientiousness, moral standards, all tend to be lowered. The Christian must be the person who holds aloft the standard of absolute purity in speech, in conduct, and even in thought. A certain writer dedicated a book to J. Y. Simpson "who makes the best seem easily credible." No Christian can depart from the standards of strict honesty. No Christian can think lightly of the lowering of moral standards in a world where the streets of every great city provide their deliberate enticements to sin. No Christian can allow himself the tarnished and suggestive jests which are so often part of social conversation. The Christian cannot withdraw from the world, but he must, as James said, keep himself "unstained from the world" (James 1:27). (ii) In the ancient world salt was the commonest of all preservatives. It was used to keep things from going bad, and to hold putrefaction at bay. Plutarch has a strange way of putting that. He says that meat is a dead body and part of a dead body, and will, if left to itself, go bad; but salt preserves it and keeps it fresh, and is therefore like a new soul inserted into a dead body. So then salt preserves from corruption. If the Christian is to be the salt of the earth, he must have a certain antiseptic influence on life. We all know that there are certain people in whose company it is easy to be good; and that also there are certain people in whose company it is easy for standards to be relaxed. There are certain people in whose presence a soiled story would be readily told, and there are other people to whom no one would dream of telling such a tale. The Christian must be the cleansing antiseptic in any society in which he happens to be; he must be the person who by his presence defeats corruption and makes it easier for others to be good. (iii) But the greatest and the most obvious quality of salt is that salt lends flavour to things. Food without salt is a sadly insipid and even a sickening thing. Christianity is to life what salt is to food. Christianity lends flavour to life. "Thou hast conquered, O pale Galilaean; the world has grown gray from Thy breath." "Have you looked at these Christians closely? Hollow-eyed, pale-cheeked, flat-breasted all; they brood their lives away, unspurred by ambition: the sun shines for them, but they do not see it: the earth offers them its fulness, but they desire it not; all their desire is to renounce and to suffer that they may come to die." As Julian saw it, Christianity took the vividness out of life. Oliver Wendell Holmes once said, "I might have entered the ministry if certain clergymen I knew had not looked and acted so much like undertakers." Robert Louis Stevenson once entered in his diary, as if he was recording an extraordinary phenomenon, "I have been to Church to-day, and am not depressed." Men need to discover the lost radiance of the Christian faith. In a worried world, the Christian should be the only man who remains serene. In a depressed world, the Christian should be the only man who remains full of the joy of life. There should be a sheer sparkle about the Christian but too often he dresses like a mourner at a funeral, and talks like a specter at a feast. Wherever he is, if he is to be the salt of the earth, the Christian must be the diffuser of joy. Jesus went on to say that, if the salt had become insipid, it was fit only to be thrown out and trodden on by men. This is difficult, because salt does no lose its flavour and its saltness. E. F. F. Bishop in his book Jesus of Palestine cites a very likely explanation given by Miss F. E. Newton. In Palestine the ordinary oven is out of doors and is built of stone on a base of tiles. In such ovens "in order to retain the heat a thick bed of salt is laid under the tiled floor. After a certain length of time the salt perishes. The tiles are taken up, the salt removed and thrown on the road outside the door of the oven … It has lost its power to heat the tiles and it is thrown out." That may well be the picture here. But the essential point remains whatever the picture, and it is a point which the New Testament makes and remakes again and again--uselessness invites disaster. If a Christian is not fulfilling his purpose as a Christian, then he is on the way to disaster. We are meant to be the salt of the earth, and if we do not bring to life the purity, the antiseptic power, the radiance that we ought, then we invite disaster. But - always pause to ponder this term of contrast. Become tasteless (3471) (moraino from morós = foolish) can refer to physical sloth or dullness, but the main reference is to intellectual life. Moraino carries the idea of ‘to play the fool’ or ‘to become foolish’ and in a sense isn't that what Christians are doing when they lose their saltiness by playing the fool for the world or ignoring Christian disciplines or giving in to lusts or disregarding warnings about sin? In the present passage moraino is used more figuratively meaning to cause something to lose its taste or purpose for which it exists. For the disciples, the salt of the earth, to lose their saltiness was equivalent to becoming foolish. It would in effect be to lose their identity. In secular Greek it took on various meanings in different contexts. Thus it meant insipid of insufficiently seasoned foods. Pure salt cannot lose its savor ("saltiness"), but the salt commonly used in the ancient world was rock salt, containing various impurities (especially gypsum). As the true salt was leached away, or otherwise removed, the so-called "salt" could indeed lose its savor and become tasteless. When those who profess to be Christians cease to be different from the world, we cease to be useful as retardants of decay. Jesus emphasized that our ability to preserve the world in order that it may see Christ in us depends on our being different. It is dangerously easy for Christians to lose their salty, preserving influence in the world. Remember that many people who never read the Bible are constantly reading us! If our conduct is untrue to our calling, our words will avail very little. Gospel preaching without holy, supernatural living is futile. Salty Salt. The story has often been told about Dr. Will H. Houghton, who pastored the Calvary Baptist Church in New York City and later served as president of Chicago’s Moody Bible Institute till his death in 1946. When Dr. Houghton became pastor of the Baptist Tabernacle in Atlanta, a man in that city hired a private detective to follow Dr. Houghton and report on his conduct. After a few weeks, the detective was able to report to the man that Dr. Houghton’s life matched his preaching. As a result, that man became a Christian. S. Lewis Johnson quipped that ""Often the only version of the Bible the world reads is that of the believer's life, and, if that is true, in the light of the weakness of the church's testimony today surely the world could use a revised version!" We are the salt of the earth, not the sugar, and our ministry is truly to cleanse and not just to change the taste. Too many Christians live their Christian lives inside their heads; it never gets out through hands and feet and lips. Salt must be brought into close contact with whatever it is meant to affect if it is to do any good. Christians are the salt of the earth. We must be willing to be rubbed into the decaying carcass of an unregenerate society. Most of us are content to sit on Sunday in our little salt‑shakers, far removed from a needy and lost humanity. A box of garden seeds looks very attractive with its pretty colored packages but those seeds must be emptied from the pretty packages into the dirty earth to die and come up again if we are to have anything to eat. Christians look pretty enough in church on Sunday morning but "Except a corn of wheat fall into the ground and die, it abideth alone. ." (John 12:24). George Barna alludes to another potential source of tasteless salt noting that four out of ten people who call themselves evangelical Christians don't believe there is such a thing as absolute truth. Barna concludes "That's the heart of the problem we're struggling with. Think about the implications for evangelism, personal spiritual growth, and having a church that really is the salt and the light. It's pretty frightening." Made salty (233) (halizo from háls = salt) means to season or sprinkle with salt. To preserve by salting. There is also one figurative use as discussed below. Leviticus 2:13 'Every grain offering of yours, moreover, you shall season (Lxx = halizo) with salt (literally "salt with salt"), so that the salt of the covenant of your God shall not be lacking from your grain offering; with all your offerings you shall offer salt. It might have seemed ridiculous to a casual bystander for Jesus to say to a handful of ordinary men, "You are the salt of the earth and I am sending you out to permeate and infiltrate and season the whole world." Yet that little band, that pinch of salt, started something that has survived the centuries and changed the history of mankind. Our Lord used the simplest figures of speech. Nothing is plainer, more universal and old‑fashioned than salt. It is such a common commodity that we take it for granted, but if suddenly no salt could be had, what a difference that would make! What would life be without salt! A little boy said, "Salt is what tastes bad when you don't have it." Christians are the salt of the earth and we ought to make a difference. 1. Salt has a seasoning influence. There ought to be a flavor, a tang, a relish, and a zest about us Christians. Someone has said that our main trouble today is not that our doctrine is false, but that our experience is flat. 2. Salt preserves. Civilization has been saved from destruction by the re­straining influence of the Holy Spirit in Christians. Salt pre­vents decay and restrains corruption. One godly person in a group will restrain evil conversation. 3. Salt purifies and cleanses. The best gargle for a sore throat is plain salt water. The church of Jesus Christ has had a purifying influence wher­ever it has gone. You may think that your community is in a bad state, but take out the church and you would not want to live there. 4. Salt heals. Lives are changed, souls saved, homes rescued from di­saster, broken hearts mended, sorrows eased, burdens lifted, sick bodies and minds made well because of the anti­septic and therapeutic power of the Holy Spirit working through God's people, the salt of the earth. 5. Salt creates thirst. God's people should develop in the hearts of men a desire to know God. We ought so to live that others would want the peace and joy they see in us. Does anybody want to be a Christian like you? The best argument for Christianity is a Christian. 6. Salt irritates. When the salt of God's truth is rubbed into this diseased old world, sick souls may smart. When the light is turned on, some will wince. The devil hates the Gospel and fights back… We are not the sugar of the earth‑nor the vinegar‑but we are salt and we will not be welcomed by a generation full of wounds, bruises and putrefying sores. We need to get into the salt business and we must start with a few. This is God's program today. It sounds old‑fashioned, but salt is old‑fashioned, sin is old‑fashioned and so is the Gospel. We have been tickling palates with fancy flavors, spicy relishes, and clever recipes borrowed from the world. Too many pulpit gourmets and theological epicures with menus from Hollywood are trying to please the jaded appetites of a fed up humanity. We need old‑fashioned salt, and if we do not start producing more of it in our churches, we shall be good for nothing but to be cast out and trodden under foot of men. Albert George Butzer said "Some Christians are not only like salt that has lost its savor, but like pepper that has lost its pep." Does God Ever Restore One's Saltiness? In Genesis 20:1-18, Abraham illustrates one who for a time lost his savor when he went to Gerar (capital of the Philistine colony on the seacoast) and lied to the pagan king Abimelech about Sarah, telling the king she was his wife. Abraham became tasteless salt for a time -- how could he talk to the pagan King about His God of truth when he himself was living a lie? And yet even while still in Gerar, Abraham was apparently "re-salted" supernaturally as evidenced by his interceding with God for Abimelech's life (see Ge 20:7). Surely this indicates that Abraham had confessed his sin and God had restored him (cf Ps 66:18, 19). Also see the testimony of the pagan king in Ge 21:22 "God is with you in all that you do". This further supports that God had restored His erring saint to saltiness. "Salt is good (kalos = beautiful, attractive); but if the salt becomes unsalty, with what will you make it salty again? (the idea is "you" cannot but it leaves open the possibility that God can supernaturally) Have (continually be having = present imperative) salt in yourselves, and be (continually be = present imperative) at peace with one another." So Jesus does leave open the possibility that although man can in no way "re-salt" savorless salt, God can just as He did in the case of Abraham's life and in the life of every believer who is willing to walk in the light as He Himself is in the light. That believer will find that the blood of Jesus God's Son will continually cleanse him from all sin. (1John 1:7) Thus cleansed and "re-salted", he can function as salt in society. Notice also the phrase "be at peace with one another" in (Mark 9:50). In context this suggests that one of the conditions of continually having saltiness is that we are continually at peace with our brethren! Several years ago, a fire destroyed a building that contained tons of ice. Author Carl Franke said that although the building had contained thousands of gallons of potential extinguisher, the water was not in usable form. The building was full of frozen assets! 1. Salt as a seasoning is useless unless it’s in contact with food and mixed into it. Jesus calls us to “flavor” society in His name through close involvement with people. We are to season society and light up our world for Christ. It’s time to thaw out the frozen assets in our lives. Our purpose on earth is not to get used to the dark, but to shine as lights. A journalism professor disguised himself as a homeless person and spent a few nights on the streets of a large city. He reported that the shelters provided him with sandwiches and soft drinks, but that nobody—not even at a church-run shelter—offered a word of spiritual counsel. How can acts of compassion open doors to witness? but also as a follower of Jesus Christ? Good deeds are no substitute for the Good News. Some people believe that our hand-writing reveals our character. Experts in the field of graphology watch for things like the slant of letters, the way they are formed, where the “t” is crossed, and how the “i” is dotted. Based on these distinctions, conclusions are drawn about one’s personality. We are told that the style of our writing shows whether we are outgoing or withdrawn, individualistic or of a conforming nature. While some may question the reliability of this practice, it reminds me of what the apostle Paul said in 2 Corinthians 3:2. He told us that Christians are epistles “known and read by all men.” The way we compose the letters of our conduct indicates the kind of persons we really are. If we are trying to please the Lord Jesus Christ, the handwriting of our lives will reveal a love for others and a responsiveness to their needs. We will also express an individuality and a willingness to stand alone for righteousness’ sake if duty demands it. Each day we will try to adjust our behavior to the will of our heavenly Father. Allow the Savior to live through you by relying on His power. Then let the handwriting of your life tell others you belong to Him. Say, what is the gospel according to you? —Anon. The Christian's life is the world's Bible. I love the story of the stressed-out woman who was tailgating a man as they drove on a busy boulevard. When he slowed to a stop at a yellow light, the woman hit the horn, cussing and screaming in frustration and gesturing angrily. As she was still in mid-rant, she heard a tap on her window and looked up into the face of a police officer who ordered her to exit the car with her hands up. He took her to the police station and placed her in a holding cell. Satan doesn’t care so much if you’re a Christian as long as you don’t act like one. If he can get you to live by his signals, he can damage and disarm you every time and dishonor the name of Christ in the process. Instead, Jesus calls believers to be “salt” and to “Let your light so shine before men, that they may see your good works and glorify your Father in heaven” (Matt. 5:16). With Jesus in the driver’s seat of our lives, we can show off the love and glory of God. IT IS GOOD FOR NOTHING ANYMORE, EXCEPT TO BE THROWN OUT AND TRAMPLED UNDER FOOT BY MEN: eis ouden ischuei (3SPAI) eti ei me blethen (APPNSN) exo katapateisthai (PPN) hupo twn anthropon. Spurgeon - A professing Christian with no grace in him,-a religious man whose very religion is dead,-what is the good of him? And he is himself in a hopeless condition. You can salt meat, but you cannot salt salt… There are people who believe that you can be children of God to-day, and children of the devil to-morrow; then again children of God the next day and children of the devil again the day after; but, believe me, it is not so. If the work of grace be really wrought of God in your soul, it will last through your whole life, and if it does not so last, that proves that it is not the work of God. God does not put His hand to this work a second time. There is no regeneration twice over, you can be born again, but you cannot be born again, and again, and again, as some teach there is no note in Scripture of that kind. Hence I do rejoice that regeneration once truly wrought of the Spirit of God, is an incorruptible seed which liveth and abideth for ever. But beware, professor, lest you should be like salt that has lost its savor, and that therefore is good for nothing. Without saltiness, salt is worthless. Without Christian character, Christians are worthless to the society in which God has placed them. Here is a sad example of tasteless salt… Gandhi says in his autobiography that in his student days he was truly interested in the Bible. Deeply touched by reading the Gospels, he seriously considered becoming a convert, since Christianity seemed to offer the real solution to the caste system that was dividing the people of India. One Sunday he went to a nearby church. He decided to see the minister and ask for instruction in the way of salvation and enlightenment on other doctrines. But when he entered the sanctuary, the ushers refused to give him a seat and suggested that he go worship with his own people. Gandhi left and never came back. He reasoned that "If Christians have caste differences also, I might as well remain a Hindu." The partiality showed by those Christians had a devastating effect on India and the world. As we have studied, they failed to manifest the sweet aroma and saltiness of the fifth beatitude, demonstrating mercy (Mt 5:7-note) Mahatma Gandhi was also quoted as answering a missionary's question "What is the greatest hindrance to Christianity in India?" with the trite reply "Christians"! WHEN our Lord reminds His people that they are "the salt of the earth," He describes the gracious state of all real believers. The grace of God is that "salt," apart from which all is moral corruption and spiritual decay. Where Divine grace exists not, there is nothing to stunt the growth, or to check the progress, or to restrain the power, of the soul's depravity. The fountain pours out its streams of corruption and death, bidding defiance to all human efforts either to purify or restrain. But let one grain of the salt of God's grace fall into this corrupt fountain, and there is deposited a counteracting and transforming element, which at once commences a healing, purifying, and saving process. And what parental restraint, and the long years of study, and human law, had failed to do, one hour's deep repentance of sin, one believing glance at a crucified Savior, one moment's realization of the love of God have effectually accomplished. Oh the intrinsic preciousness, the priceless value, the sovereign efficacy of this Divine salt—God's converting, sanctifying grace! Effecting a lodgment in the most debased and corrupt heart, it revolutionizes the whole soul—changing its principles, purifying its affections, and assimilating it to the Divine holiness. There, where God's love is felt—there, where the Holy Spirit is possessed—there, where the Savior's atonement is received, and His image is reflected—there is found the precious "salt of the earth." The world does not know it, and even the lowly grace may be veiled from the eye of the Church—few mark the silent tear, or see the deep prostration of the Spirit before the Lord, or are cognizant of its hidden joy, or measure the extent of the holy influence, noiselessly yet effectually exerted; but God, looking from His throne of glory through the ranks of pure intelligences that encircle Him, beholds it; and in that humble mind, and in that believing heart, He sees the divine and precious "salt," which beautifies, sanctifies, and preserves the world. He sees true holiness nowhere else; He recognizes His own moral image in no other. The Christian is emphatically "the salt of the earth." BEING IS DOING. Our greatest work for God and man is to be. The influence of a holy life is our greatest contribution to the salvation and blessing of the world. Though you cannot preach, or teach, or engage in some sphere of Christian service, do not be greatly moved, if only you can live the life of God amongst men. 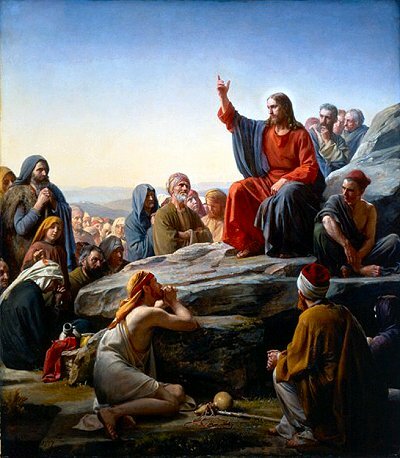 Our Lord for thirty years was content to live an absolutely holy life, as the Lamb of God without blemish and without spot; and His supreme work in the world was not only to give His life as a ransom, but to live His life that He might leave us an example that we should follow in His steps. Too many Christians seem to suppose that the main object of life is to engage in a sphere of direct service, whilst they leave their personal character to take care of itself, and to develop almost at haphazard; whereas our main thought and care should be that Christ should be formed in us, and be revealed in every look and gesture, every word and act. Out of that will come naturally, inevitably, and blessedly, our direct Christian service. The best work is that which arises out of the simplicity and beauty of our witness for truth and love. We must, of course, guard against extremes. On the one hand, we may attempt so much service as to neglect that inner culture which is priceless in its effect on service, and our personal inconsistencies will neutralize the effect of our Christian activities. On the other hand, we may sincerely believe that we are cultivating our character, when, in fact, we are sinking into a dreamy lethargy, from which we need to be aroused by the trumpet-call of duty to a dying world. We are apt to forget that the development of the inner life is not perfect, unless it issue in such going about doing good, as was the flower and fruit of our Saviour's thirty years. Though Persecuted. Our Lord had been describing the reception which the type of character that He had come to implant would certainly encounter. Instead of attracting men by its heavenly beauty, it would certainly repel them. Instead of commendation and welcome, it would arouse dislike and rebuff. The great world of men would not appreciate the poor in spirit, the mourner, the meek and merciful, the pure in heart or maker of peace, but would reproach, and persecute, and say all manner of evil falsely. But, notwithstanding all, He insisted that they should continue to bless the world by the silent and gracious influence of holy lives. Reviled, they must bless; persecuted, they must endure; defamed, they must entreat; threatened with death, they must still be as salt to their persecutors, and as light to their defamers. However men receive our testimony, whatever they may say and do against us, notwithstanding the unreasonableness of their dislike, we must continue to be what our Lord would have us be, nay, we must let Him who is within us shine forth through us, so that men may be compelled to admit that the unearthly beauty of our lives is the supreme proof of the divinity and glory of our religion. You ask what is the good of being good. Your detractors and oppressors vaunt themselves over you, take every advantage of your quiet, unresisting gentleness, and misinterpret your self-restraint. It would almost appear that they are driven to greater extremes of wickedness because of the provocation of your goodness. The soldiers of the Roman governor probably never mocked one of their ordinary victims as they did the holy, unresisting Saviour. The gentle and loving wife will sometimes extract the most malignant and bitter hatred of her husband, such as he would show to no other. But you do not know how your behaviour is beginning to thaw that iron-frozen soil, how often and deeply compunction is at work, or how nearly the hatred of your oppressor is being overcome by love. The spring warmth may seem to fall on the frozen masses of snow and ice in vain, but every hour of sunshine is sapping the reign of the ice-king, and hastening the inevitable break-up of his supremacy. That workingman who has borne the insults of his shopmates for Christ will presently have the ringleader come to beg his pardon, and with tears in his eyes ask him to pray for him. That oppressed wife will have the pleasure of leading her penitent husband to the cross. That sister will be won by her sister, who has borne contumely and reproach with unswerving gentleness. Be of good cheer, your sufferings will have their most blessed result in overcoming evil by good, as we have said. Remember, the Apostle speaks of "the kingdom and patience of Jesus," which means that patient suffering ultimately secures a blessed supremacy, a royalty, an over-mastery of hardness and unkindness by gentleness, truth, and love. When the Forth Bridge was in making, the workmen came to a crucial point, where two of the most important iron girders refused by some inches to come together for the bolts to be driven through, a process which was absolutely essential to their union and the stability of the whole fabric. Every mechanical method to bring them together was tried with no purpose; and finally, in despair, all further efforts were abandoned for the night. It was summer weather, and the sunshine of the following morning was very hot, so much so that the great masses of metal expanded beneath the genial rays, and the results were achieved by the silent touch of the sun which had defied the utmost efforts of force. So in human life. Consistency of character, purity, gentleness, sweetness, such holy living as issues from the qualities which our Lord has enumerated, will avail when the keepers of the house shall tremble, and the strong men will bow themselves. The Lord knew well the condition of the world. To His holy and unerring judgment it was a carcase slowly rotting to putrefaction, and sorely needing some influence to stay its corruption. There was never an epoch in the world's history fuller of dazzling genius than that in which He was born. Some of the most brilliant names of history were shining still in the midnight sky when the bright and morning star arose over Bethlehem. But the grossness of the age was unparalleled and indescribable. The allusions made to it in the Epistles are sufficiently terrible, but the whole truth is only revealed in classic literature itself, which survives to show that the earth was corrupt before God, and that every imagination of the thoughts of man's heart was only evil continually. In our Lord's eyes, also, to advert to the other metaphor, the world lay under the power of thick darkness. In its wisdom it knew not God. Professing themselves wise, men had become fools. The god of this world had blinded the eyes of those who believed not, and they groped in the noontide as in the murky midnight. Such has been, is, and will be, the condition of men without the Gospel. The history of the human family is always repeating itself. We cannot be surprised either at the description given by missionaries of the awful condition of heathen countries, or at the outbreaks of lawlessness and crime in nations which are only nominally Christian. Our inventions, organizations, and boasted civilization, may affect the exterior of our society, but if it were not for the presence of the Church of the Lord Jesus, and the witness borne by the lives and words of her members, there would be nothing to save it from the pit of corruption, which has swallowed up every great nation that has risen to lead the race. Men rage against "Exeter Hall," and revile what is called "the Nonconformist Conscience," as they did against the Puritans in bygone centuries, not realizing that they evince the antagonism of corruption to the salt, and of darkness to the light, and that the very existence of our society is more largely due than they suppose to the very elements they so much dislike. Our consistent holy living will act as an antiseptic to arrest the corruption around us. It is said that the presence of a little child, with its blue-eyed simplicity and purity, has often arrested the commission of dark crimes; and as much should be said of the influence of our own daily living. A sudden silence should fall on certain kinds of conversation when we enter the room. This or the other form of worldly amusement, which has entered professedly Christian homes, should be felt out of place when we are staying there. And right through the society in which we move there should be a consciousness that there is an incongruity between our character and all that savours of impurity, falsehood, or selfishness. We do not want to impose a sense of restraint and gloom on social gatherings when we enter. Our presence should be an incentive to the merriment of the children, the cheer of the depressed, the gladness of young and old. Flowers should burst into beauty at our steps, songs should overflow in our paths, and innocent laughter should be our accompaniment. The mountains and the hills should break forth before us into singing, and all the trees of the field should clap their hands. Instead of the thorn should come up the fir-tree, and instead of the briar the myrtle-tree. But to all that is unseemly and unworthy our presence should act as an antiseptic. A young boy, fresh from his mother's teaching and prayers, was plunged suddenly into a large lawyer's office, where he was articled. At first he was bewildered by his strange surroundings, then the crimson mantled his cheek, and tears brimmed in his eyes. "What's the matter with you, youngster?" said a coarse voice. "Do you want to go back to your mother's apron-strings? … No," was the reply, "but we never said such things in my mother's home as you say here." The answer elicited a burst of laughter, but the head of the office said: "Gentlemen, this lad is right, and as long as he stays with us I must request that you modify your speech." And from that moment the whole tone of that office was altered. The lad's presence acted as salt. We may easily lose our savour. Salt left in contact with a damp soil ceases to be salty, and is good for nothing but to be trodden under foot. It is neither fit for the ground nor the dunghill. Lot lost his savour. Sodom went on its way, regardless of his presence in its midst. The Seven Churches of Asia lost their savour, and, with those of Northern Africa, were trodden down by the Moslem. Nothing is so useless and worthless as an inconsistent and powerless Christian (Ezek. 15:3-5). Oh, break your heart if sin is as shameless and reckless in your presence as in your absence! What have you done to forfeit the power you should exert? Repent, and do the first works! Yea, ask the Lord Jesus to infuse into you His own strong, sweet, pure nature, before whom the demons were driven forth, and by whose presence, through His Church in the world, an arrest has been placed on many of those grosser forms of sin which disgraced the world of His time, and still hold sway in countries where His name is not known.